ASDA is sad to report the death of Major General Bill Lefler, age 86, on Tuesday morning, September 25. Many remember “the old General” as a lively and outgoing personality who never met a stranger. As former Chief of the Army Dental Corps, Dr. Lefler counted among his former patients First-Lady Mamie Eisenhower, Sen. Bob Dole, Sen. Strom Thurmond and a host of other high profile military and political leaders. Back home in Arkansas, he served in leadership positions for Governor Mike Huckabee and Governor Mike Beebe. No doubt, you join us in extending our thoughts and prayers for the Lefler family. HOT SPRINGS VILLAGE — Billie B. Lefler, 83, of Hot Springs Village, passed away on Monday, Sept. 25, 2017. Maj. Gen. Bill B. Lefler was born in Rawlins, Wyo., on Oct. 20, 1933. Bill grew up in Clinton, Ark., where he was active in sports, church and his community. 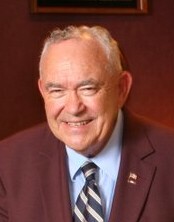 He attended Hendrix College from 1951-1953. While at Hendrix, he met his future bride, Carolyn Ellis. They were married in 1955. He graduated from the University of Tennessee School of Dentistry in 1956 and was commissioned in the Army in 1956. During his military career of over 34 years, General Lefler distinguished himself as a clinician, teacher, administrator and leader. He held a wide variety of important command and staff positions culminating in 1986, when he was selected as the Assistant Surgeon General for Dental Services and the 20th Chief of the Army Dental Corps and promoted to major general. Following his retirement, General Lefler joined the staff of the American Dental Association as assistant executive director for the Division of Legislative Affairs and director of the Washington, D.C., office of the American Dental Association. In January 1995, General Lefler moved back to his home state of Arkansas. He practiced dentistry at Cordoba Center Dental Clinic (now Lefler Dental) from 1996 until 2013. He served on numerous boards and committees, such as the Boys & Girls Club and the Donald W. Reynolds Center on Aging. He was proud in helping to get recognition for Hot Springs Village as a Volunteer Community of the Year for Arkansas in 2000. The governor appointed him as the initial chairman of the Arkansas Tobacco Settlement Commission. Bill was an active member of the Village United Methodist Church, where he was on the pastoral council, sang in the choir, played in the band and taught an annual Bible study class for 17 years. He was involved in many organizations. Some of them were VFW, MOAA, Evening Lions and Cedar Mountain Singers where he was the master of ceremonies. He was well known for telling corny jokes. If he wasn’t a member of an organization, he was always seen in the audience enthusiastically supporting them. He is survived by his loving wife of 62 years, Carolyn; daughter, Tracey Salter (Jack); sons, Dr. Tom Lefler (Cindy) and Dr. Mark Lefler (Katherine); eight grandchildren and eight great-grandchildren. General Lefler was a man of passions — family, friends, community and country. The celebration of his life will be 11 a.m. Saturday, Oct. 7, at the Village United Methodist Church. In lieu of flowers, the family request gifts to be made to the Village United Methodist Church, Hot Springs Village, Ark., or Intrepid Fallen Hero’s Fund (http://www.fallenherosfund.org). Arrangements have been entrusted to CedarVale Funeral Home. For online condolences visit at http://www.cedarvalefuneralhome.com.